It is a testament to our great Race, that mateship, camaraderie, and colourful characters are always recurring themes. Be it heated pub debates, or quiet family dinners, when the Sydney Hobart is inevitably brought up again for another year, no symposium of our great Race would be complete without a few (sometimes tall) tales, of the famous parties, and party-goers alike. And one such party back in 1962 stands out in the memories of many. Wealthy New Yorker, Mr. Sumner A. “Huey” Long, had brought over what was then regarded as the world’s greatest sailing yacht Ondine. A truly cutting-edge design, the entirely aluminium hull gleamed in a fresh coat of pale blue paint and Huey Long, hoping for the rare double win, was justifiably confident. Huey’s confidence, however, seemed misplaced after Ondine, trailing behind Sydney local, Peter Warner’s, Astor for most of the race, came within sight of the finish line, destined for second place. It was only when Astor’s huge wooden spinnaker pole shattered and broke, that Long was able to bring his state-of-the-art masterpiece home to claim line honours by a mere 100 yards. Long’s come-from-behind line honours elation was short-lived however, as Vic Meyer powered home in his steel yacht Solo, much sooner than Huey would’ve hoped. Meyer ended up claiming the ultimate handicap trophy, snatching the double-win from Huey’s grasp, but Long was not about to go down without a fight. Huey had heard of a photograph of Solo taken at the start of the Race, a good, clear photo of the deck with no life raft in sight (as was required). Certain that Meyer had broken the race rules, Long flew to Launceston where the image was rumoured to have appeared in the local paper to revive his chances at the double. Peter Warner, ever graceful in his close defeat, was hosting some drinks aboard Astor. The revellers noted that no-one was ever invited aboard Ondine for a drink, a topic that was hotly debated among the merrymakers. Perhaps unfortunately for Huey Long, the merrymakers in question were a young Rupert Murdoch and his crew from Illina: Henry Raymond “Thunder” Kerslake, George “Raw Meat” Pearce, Murdoch’s Daily Telegraph manager “Curley” Brydon, and Don “Don Two” Mickleborough (“Don Juan” was already taken!). It was Murdoch who, sometime in the wee hours of the morning suggested, “let’s go aboard Ondine right now and have a drink!” Don Two took it further, suggesting they make it a real party, get some invitations printed, and invite a few more people aboard. Huey Long, of course, was in Launceston. That morning, Murdoch, ably assisted by Curley, convinced a local printer he was Ondine’s owner and had one thousand party invitations made (pictured above). Impressively printed in ‘Ondine blue,' they advised of a celebration to be taking place aboard the yacht at 8pm the next evening. Twenty 18-gallon kegs of beer were bought and sat all around the dock, stewards were commandeered from the various local establishments and paper cups were bought in spades. It was a spectacular scene as well over a thousand people began pouring down to the dock. Having meticulously prepared Ondine for the party, and with still no sign of Huey Long, Sven Joffs continually eased out the dock line to prevent anyone coming aboard. Huey, hearing about the commotion from Sven Joffs, made straight back for Hobart and his prized yacht Ondine. When he finally appeared at the party, it is reported that he wasn’t at all amused, retreating rapidly to a hotel and spending the next few hours trying unsuccessfully to charter a flight home. Huey Long, however, didn’t seem to suffer any long-term effects, returning year after year in successively bigger boats. 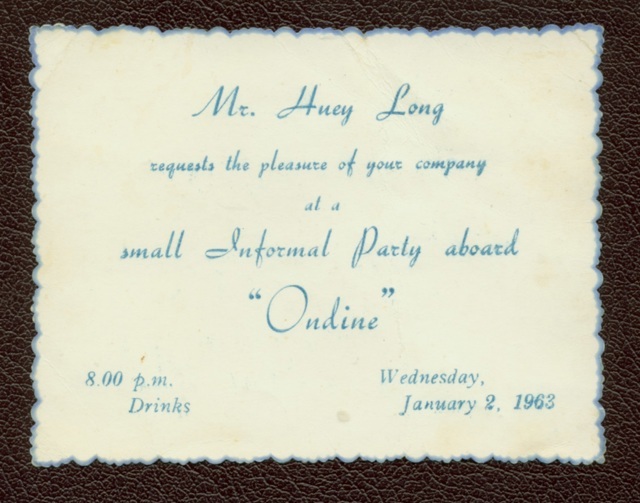 It is even said that Huey was seen at the Cork Yacht Club after a Trans-Atlantic race, with a copy of the invitation in hand, bestowing upon his avid listeners the story of the 1962 Hobart, and the party he put on. This and many other amazing stories of the history of the Cruising Yacht club of Australia can be read in "Ratbags to Respectability," a celebration of the history of our great Club. You can purchase this and other great memorabilia at our online store available here.